HAS A NEW MONTH AND A NEW VENUE! Starting time is 11:30am. Cost is $135 per golfer ($540 per foursome) which includes lunch, 18 holes, golf cart, dinner, and drink tickets. Sponsorships are also available from $100 - $5,500. You can help by putting together a foursome, sponsoring the event or donating an item for the event raffle. You may also do so by email, soulfood@thegatheringwis.org - or by phone, (414) 272-4122. We are available to answer any questions you may have. To view the Spring 2019 Newsletter, click here. Our newest cook team, The Spice Girls. To view the October 2018 Newsletter, click here. People of The Gathering is a collection of work sharing the stories of volunteers, staff, board members, donors, meal guests and all who lie between. We’re pleased to introduce you to People of The Gathering and hope you enjoy reading their stories as much as we’ve enjoyed writing them. Guillermo, a native of Mexico, came to the United States in 2004 as an expatriate with Kohler Co. He moved to Sheboygan in 2006 and it was there where he met Ellen born and raised in Wisconsin, whom he married in 2011. Today, Guillermo works as a Senior Talent Development Consultant at Baird. His day-to-day work includes coaching and training his teams toward success and cultural diversity. Guillermo’s passion for cultural diversity developed since he was young. He lived and worked in four different countries before coming to the US and becoming immersed in American culture. As a Mexican immigrant he has experienced seeing the world with different perspectives and enjoys sharing his Mexican culture with his American friends and colleagues. 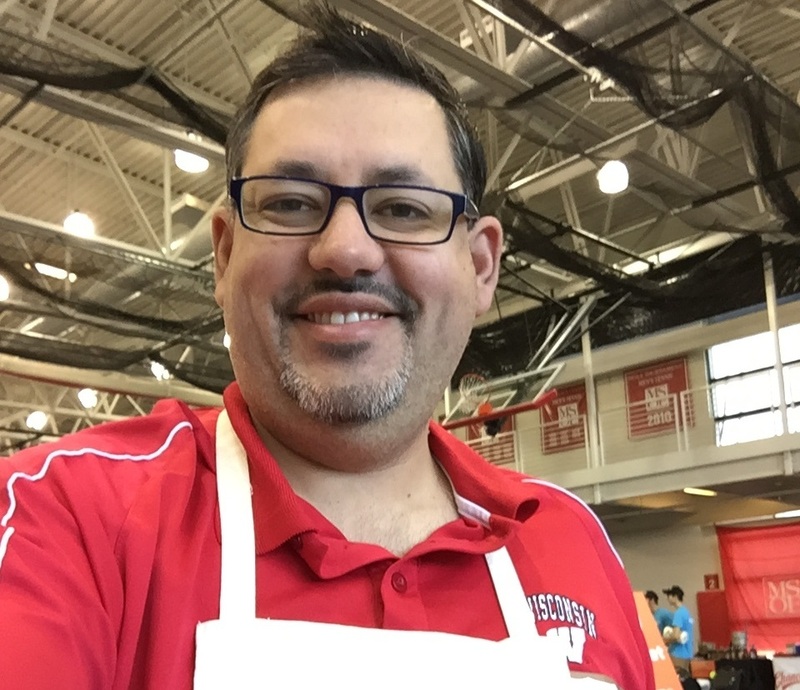 When Guillermo first joined The Gathering’s Board of Directors, The Gathering was actively working to diversify its Board, and Guillermo took the opportunity to bring his talent and passion to the organization. Guillermo is currently serving as The Gathering’s Board President. At 25 years of age, Ken was living on Milwaukee’s streets and eating at The Gathering. Even amidst his housing crisis, Ken felt called to volunteer, and for a year and half spent his weekdays with The Gathering’s Breakfast Program and 1-2 weekends a month serving as a Volunteer Coordinator for The Gathering’s Saturday Lunch Program. The photo above was taken by Ken during the time of his homelessness. He was greeted by the sunrise, just before he made his way to The Gathering’s Breakfast Program. Ken (Kenneth Bernoska) was born in Illinois and raised in Oconomowoc, Wisconsin. He has fond memories from his early childhood that include going on camping trips and vacations with his family, but in his teenage years he began to experience trauma and violence in the space where he was living. This led to food and housing insecurities. As a young adult, Ken worked to overcome this trauma and ultimately found his way to Milwaukee. Now, at age 27, Ken continues to donate time to The Gathering. He is currently working toward obtaining a fellowship with The Obama Foundation and has finally secured stable housing. Jacob Slocum grew up as a member of St. James Episcopal Church, a Gathering volunteer and an aspiring musician. Twice he faced food and housing insecurities that tested him as an individual. As a teenager, he found refuge at St. James where he was first introduced to The Gathering’s meal program. He was an active volunteer and felt close to The Gathering’s mission. In his twenties Jacob moved to Chicago to pursue his music career. His first album was just released and he chose The Gathering to be one of the recipients of a portion of the proceeds. At just 29 years old, Jacob confidently shares, “I am who I want to be.” The Gathering is proud and thankful to be a part of Jacob’s journey. Jillian is a student at Glenwood Elementary in Greenfield, Wisconsin. 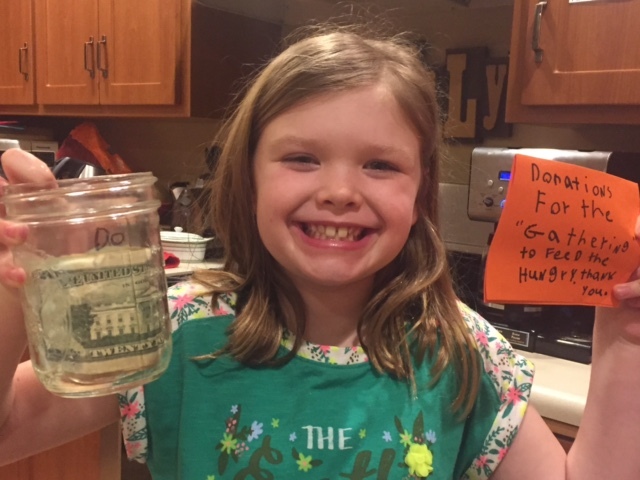 In February, Jillian and her second grade class collected money and food items to make 125 bag lunches for The Gathering. They wrote letters to their families and their teachers about wanting to help people in need. They learned that people who were homeless had joys and fears and families just like they did; and that 40% of the homeless were children just like them. Each lunch included a second grader’s personal handwritten note. On Saturday, November 18, employees of Komatsu Mining Corporation and their families served the Thanksgiving meal to over 200 guests at The Gathering’s State Street Site. They also donated pumpkin and apple pies for the feast. Komatsu (formerly Joy Global) has supported The Gathering’s work for twenty years. Cathy Stagmer, Komatsu’s Manager of Social Responsibility writes, “The Gathering is one volunteer activity that always finds employees inviting their family members to join in giving back… For some it has become a family tradition, for others it is hopefully the start of a lifelong practice of helping those in need.” Click here for more of the story. For several years now, students at Milwaukee College Prep (MCP) have helped The Gathering with our Thanksgiving meals by baking pies for dessert. They continued the tradition this year under the tutelage of Gathering Board Member and MCP Community Outreach/Volunteer Coordinator, Maggie Broeren. At the school’s 36th Street Campus, students prepared and baked 20 pumpkin pies for The Gathering’s nearby ONG (Our Next Generation) meal site where 30% of guests are children themselves. “We are grateful to share this experience with The Gathering guests,” Maggie stated. And we are grateful for the enthusiastic participation of MCP. 2018 GATHERING GOLF CLASSIC - It's a Wrap! This year’s Gathering Golf Classic netted $11,500 for our Community Meal Programs. Thank you to our sponsors, golfers, raffle donors and event volunteers! GOLD: Komatsu Mining Corp.; Michael & Ginny McBride; Twin Disc, Inc.
To view photos of the event, click through the photo gallery below!